When you’re actively trying to fill positions within your company and you’re looking to do so quickly, it’s very easy to fill your schedule with interviews and meetings to discuss interviewees. Doing so, you lose company time by bringing candidates into the office and your own valuable time by trying to squeeze in too many interviews. Video interviews can be a great help with this. They are an excellent way to streamline the screening process with candidates. In particular, here are three things to consider in order to make a video interview more effective. 1. Ask some warmup questions. Whether it’s a one-way or a live video interview, offering some easier questions earlier in the interview can make the candidate feel more comfortable while still providing you with valuable insight. Asking a few ice breaker questions may help you obtain some more genuine answers and also allow the candidate to get in the flow of the interview. This prepares them to be at their best for the more difficult questions later in the interview. 2. Balance your questions for job and personality fit. Balance the questions you ask to get information about their qualifications as well as their professional interests and personality. An initial interview is the perfect time to get a feel for a candidate’s personality. Video interviews grant you ample opportunity to ask a few questions that you may not have time for in a formal interview. Interview questions about what a candidate is passionate about provide you with great insight on their personality, what they enjoy doing, and how well they will fit in your work environment. In addition to inquiring about their qualifications and personality, sprinkle in some questions about their odd-jobs or activities during times of unemployment. If you’re interviewing a recent graduate, inquire about their summer jobs or on-campus positions or extra-curricular activities. 3. Pick up on the subtleties. Pay attention to details in a video interview much like you would a traditional interview, only with a closer eye on how the interviewee has prepared. As an employer, you should expect your candidates to prepare for a video interview just as they would for a traditional one so make that part of your evaluation criteria. Take notice of their attire; have they dressed appropriately for the interview? Watch their hand gestures, eye contact, and other body language; are they slouching comfortably, swiveling in their chair, distracted by things in the room? Video interviews are a business tool to take advantage of when going through the hiring process. With a solid video interviewing strategy in place, you can get to know a candidate on a more personal level and narrow your list of candidates more easily and efficiently. Have you used video interviewing before? 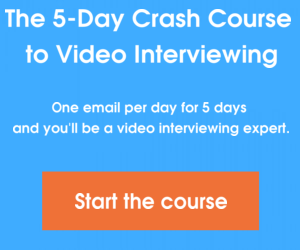 What strategies and guidelines helped you become an effective video interviewer? Discuss in the comments below!